Firstly, complete off topic – please help me out by answering the poll on the right hand side of my blog, I’d really appreciate your help and suggestions! I realise it might be a bit late for party dresses now, but I couldn’t resist picking out a few of my favourite partywear dresses for this season. I absolutely love looking at all the glitz and glamour dresses at this time of the year, despite the fact I barely ever go to parties. I feel like NYE and Christmas are some of the very few times you can wear the sparkliest outfit ever and get away with it. 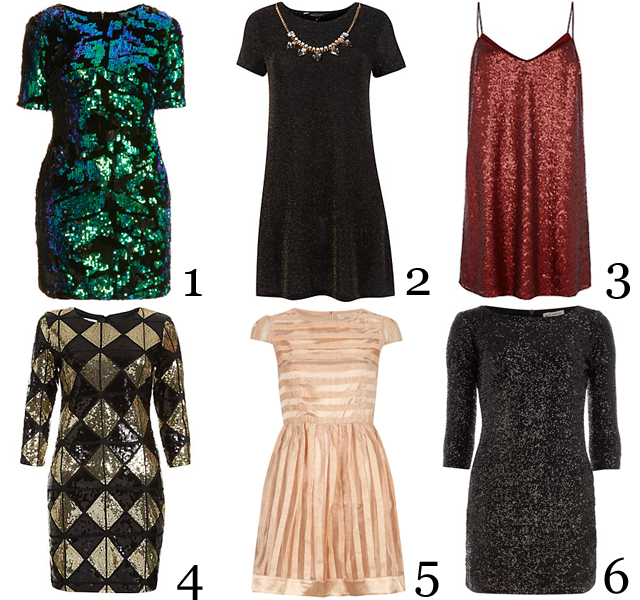 The Topshop Sequin Velvet Dress has to be one of my favourites which is very similar to a popular Motel number. The varying blue-green sequins is just gorgeous. If you want something a bit less figure hugging then maybe number 2, the New Look Black and Gold Glitter Trim Tunic might me more up your street. It has a slight gold shimmer but it’s not so in your face as some of the others, I also love the fact it already has a necklace with it – one less thing to worry about! What’s even better is that it’s currently on sale for £16.00. BARGAIN. If you prefer not to look like a glitter ball, the Dorothy Perkins Gold Organza Dress is ideal. Although here is looks much more like a champagne shade, It’s still glam enough for any party but a lot more subtle! Have you got any parties planned? What one would you choose?